The preinstalled “Find My iPhone” App has an iOS activation lock. This is to prevent any strangers from getting access to your iPhone. It is a security feature enabling users to prevent their iOS device from falling into the wrong hands of perpetuators. In order to activate iOS activation lock, first enable it on your device. This links your device, iPhone, iPad, iWatch to the Apple servers. This passcode protected lock is a convenient way to keep your device safe. You would need to type in a password on order to deactivate this lock. 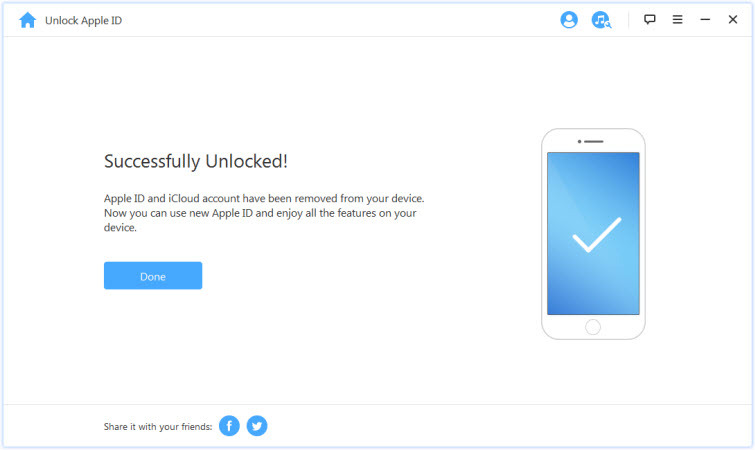 It is quite possible that you open your Apple device and find that iOS activation lock is still linked to the previous owner’s account. You need to contact the previous owner and ask them to erase the device and remove the iOS activation lock. The screen might view either of the two things. If the device asks for both an Apple ID and passcode, it means the device has already been erased. You can contact the previous owner to follow the steps below to remove their account. Go to https://www.icloud.com and log in with his Apple ID and password. Tap “All Devices” and choose your device. Then you restart your iDevice. It won't be linked to the previous Apple ID any more. You just need to follow the onscreen instructions to set it up and enjoy it. If the device asks for only password for an existing Apple ID, it means the device hasn’t been erased yet. The previous owner should remotely erase the device and then remove the device from his iCloud account. 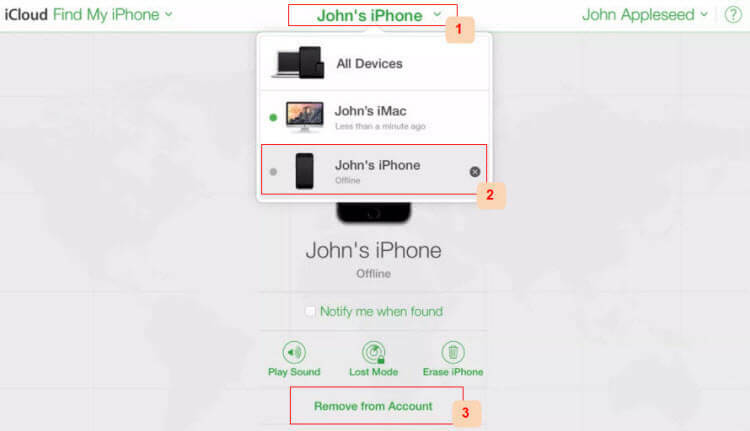 Find and select “Find iPhone”. Tap “All Devices” at the top and choose your iDevice. Enter their Apple passcode and hit “Next”. Then hit “Next” again without entering a phone number. When it's done, everything in your device will be deleted including the Apple ID account. But note that, this takes effective only when your iPhone has internet. The above ways shows you how the previous owner can remove iOS activation lock remotely for you, but what if you can't reach for the previous owner? 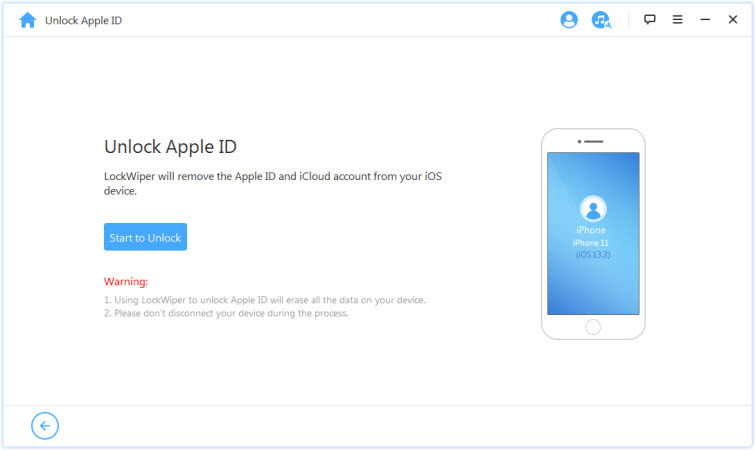 Then you can try iPhone unlocker tool to remove Apple ID or iCloud account without password. This is what iMyFone LockWiper can exactly do for you. LockWiper is the right tool you must have when you forget any passwords or passcodes. Various Locks Supported: All passwords or passcodes are supported to be removed like Apple ID password, screen lock passcode, restriction passcode, etc. Click either blue "Download" buttons above to download the program and install it on your computer. Then follow these steps. 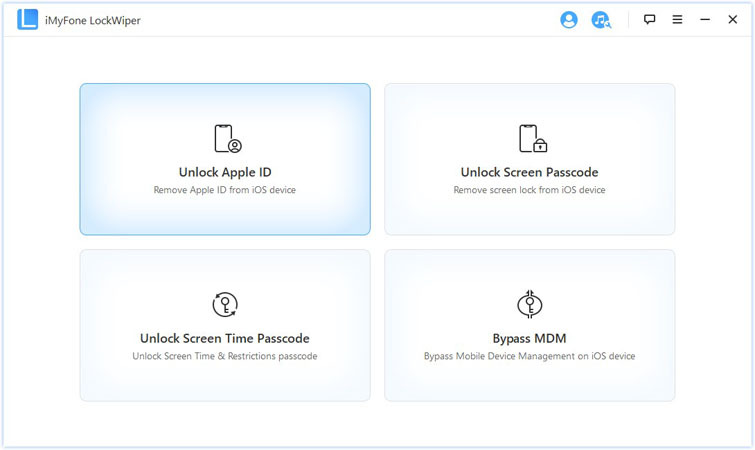 Step 1: Open LockWiper on your computer and select the "Unlock Apple ID" mode from the home interface. Step 2: Connect your iPhone or iPad to computer and trust the connection. When your device gets recognized, you will see "Start to Unlock". Click on it. iMyFone LockWiper will start unlocking immediately. You will be told "Successfully Unlocked!" when it completes. When it's done, you can now set up your device with your own Apple ID and enjoy all the features. Instead of going through all this trouble it is better that you check your iDevice for the iOS activation lock before purchasing one that is already used. You can check iOS activation lock status of your device by visiting https://icloud.com/activationlock from any computer. Or you should switch on the device and see if there is any passcode required to continue. You would know it instantly if the device has an iiOS activation lock or not. To completely ensure that the device is safe to purchase from an authorized retailer. If you see the screen displaying “Set up your iPhone” “Set up your iPad” or “Set up your iPod” you should be content that the device does not have an iOS activation lock. Erase your iDevice and turn off iOS activation lock before you sell or give away your device. Or other person can not activate and use the device. Turn off iOS activation lock before sending your device to repair. (It is always wise to play safe. If you are concerned about your privacy, you can also back up your data and reset.) Or the technicians cannot be able to perform service on your device.